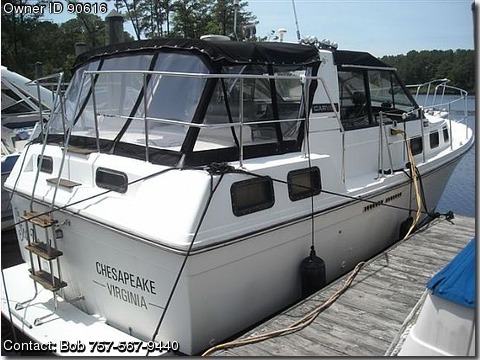 New upholstery, new GPS, new Marine Radio, New Stereo, A/C, Battery Charger, new carpeting, refinished teak woodwork, new linens in aft cabin, new table and top in main salon, new fuel lines,new fuel pumps, new fuel ports, canvas 1 year old, bottom cleaned and painted 6 months ago, twin 230 hp V8 305 cu in Merc engines. Original engines but records show starboard one was pulled out for repairs. Gas engines, 180 gal total tanks, fresh water tank. Have original Carvers Owners manual. All records for repairs available.